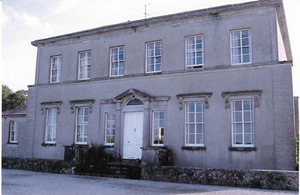 The manor at Mount Dalton is one of the few remaining historical Dalton homes in Ireland. 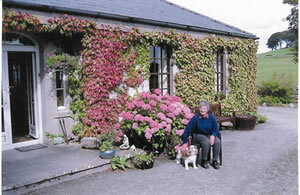 It is located in Rathconrath, County Westmeath just west of Mullingar. The home was built in 1784 by a line of Dalton Counts and it's history has been reported in DGS Journal 29, pp 49-53 and in "Daltons in History", Vol. 5, No. 12, Dec 2002, "Only a Sketch Remains". (This refers to the obelisk monument that once graced the grounds). The entrance is flanked by stone pillars and inside is a gatehouse that is covered with colorful flowers in the summer. On the site are the remains of the former Dalton castle and cemetery. In recent years visitors to the Mount have enjoyed fishing in the small lake. On Sunday, July 31, 2005 DGS member Mrs. Catherine Gibson-Brabazon and current owner of Mount Dalton will host a tour of sites in the vicinity of the Mount of genealogical interest to Daltons. This area was the scene of many significant events in their history. It is a once in a lifetime opportunity to learn first-hand of the turmoil that beset Daltons in this land. If you have not already sent you reservation form to the Chairman of the Dalton Genealogical Society, Michael N. Dalton in Surrey, England you may want to do so. His e-mail address: MichaelNDalton@aol.com. You may also enter the Archives section located on the home page and read the particulars concerning the Dalton AGM to be held in Dublin on July 30, 31 2005. Scroll to the January 2005 and February 2005 issues. The meeting, lecture and dinner will be held on July 30, 2005 in Dublin and the group will drive to Rathconrath on Sunday morning, July 31, 2005 for the Mount Dalton activities. At present approximately 50 attendees have sent in their reservations; about 17 are Americans. A copy of the reservation form may be obtained by clicking here, Reservation Form. We look forward to seeing you in July 2005. Note: Photos courtesy of DGS member, Cecilia Lange, Aurora. Colorado. In the February 2005 issue of "Daltons in History", there was a mention that a request had been made to the Herald's Office at the National Library of Dublin for a group of Dalton pedigrees from the Archives. That order is being filled and copies of 5 Dalton pedigree documents are on their way. The DGS now needs assistance in locating Dalton research from the Manuscript Reading Room of the National Library. There are at least 11 volumes of " Manuscripts Sources for the History of Irish Civilization " in the National Library. They contain some very early references to Daltons. Mike Dalton of Oregon will be researching the famous Dublin historian, John D'Alton. John McGovern, the Archivist at Millmount Archives in Drogheda writes that there is a great deal of material on John D'Alton at the Royal Irish Academy, Molesworth St. Dublin. Mike plans to compile information from the headstones at Glasnevin Cemetery in Dublin, where John D'Alton and many other prominent Daltons are interred. Before applying for birth, marriage or death certificates, check the availability of parish records at the url given below. There are a number of parishes with 18th century records and the earliest one, 1702, is in Waterford & Lismore. Waterford consistently saved the earliest records. Genealogical Office documents are indexed in Hayes', Manuscript Sources for the History of Irish Civilisation, Ms470, (the section Persons probably being the most useful to the family researcher) and can be accessed through the Manuscripts Reading Room of the National Library. For those who will be doing research in Northern Ireland, the URL and address is located at the end of this article. The following details for research in Dublin have been supplied by K. T. Mapstone. Long lines in the summer months behooves one to order as many records as possible beforehand. Note: August 1, 2005 is a bank holiday. General Register Office, Joyce House, 8-11 Lombard Street East, Dublin 2, Opening hours: 9.30am-4.30pm, Monday to Friday (excluding bank holidays). Certificates: Birth Certificate, Death Certificate, Marriage Certificate, Short birth Certificate. Particular Search: €1.90 A search (in the public office by the applicant) over a period not exceeding five years for any given entry. General Search: €15.24 Search (in the public office by the applicant) through the indexes to either Births or Deaths during any number of successive hours not exceeding six, or to indexes to Marriages during any number of successive days not exceeding six, without specifying the object of the search. (Fee does not include the cost of certificates or photocopies). Note: These search fees only apply to personal callers to the G.R.O. office in Dublin. Photocopy of entry in the Register: €3.81. When reference information is supplied: €1.90. Reference information consists of Year, Quarter, Volume and Page No. Authentication of an existing Certificate €1.90. The National Archives, Bishop Street, Dublin 8, Opening hours: 10.00am-5.00pm, Monday to Friday (excluding bank holidays) www.nationalarchives.ie You may print an application for a reader's ticket in the Niall McCarthy Reading Room online. An index of the Parish Registers available in the National Library, is at http://www.nli.ie. The National Library also requires a reader's ticket. Photo I.D. is needed. You may print an application online. DGS member Archie Dalton of Tennessee has sent a very long pedigree for the DGS Archives. Because of widespread interest in the Pittsylvania, VA Grainger, TN Daltons, Archie has given permission to print the following introduction to his family tree. He also acknowledges contributions from Don Hadrick. 1. REUBEN1 DALTON was born 1752 in Bedford County, Virginia, and died August 19, 1822 in Grainger County, Tennessee. He married ELIZABETH SHOCKLEY c. 1771 in Pittsylvania County, Virginia. She was born before 1765 in Pittsylvania County, Virginia, and died after 1823 in Grainger County, Tennessee. Notes for REUBEN DALTON: Reuben Dalton is buried in the woods near the Bluff Davidson graveyard near Thornhill, TN. Reuben Dalton it is said was a soldier in the Revolutionary War. He did serve as an Ensign in Captain Jonathan Isham's Company in the Virginia State Militia in the 1780's. Reuben acquired 170 acres in the area know as Cranberry Creek that would eventually be included in Carroll County, Virginia. His property adjoined Ogle and John Witcher who would be the father or grandfather of Matilda Witcher who married Carter Dalton. One of his neighbors was Richard Shockley, who would become his father in law, and John Dodson, who was the grandfather of Samuel Dodson Jr who married Mary Polly Dalton, Reuben's daughter. Also nearby were John Williams Jr., and William Williams. William Williams was the father of Rebecca Williams, the wife of Enos Dalton. Reuben was active in County affairs serving as constable and surveyor of the road in the new County of Grayson. Reuben sold 100 acres of his land in 1797 to Samuel Brown, and the balance in 1801 to Thomas Ogle Jr. He moved his family out of Virginia into Tennessee about 1801. He is listed on the tax list in Tennessee as owning 200 acres of land for the year 1797, but may have stayed on in Virginia until 1801, when he sold the remainder of his land. Notes for ELIZABETH SHOCKLEY: Elizabeth Shockley, it is whispered, was a witch. Quite possibly, Elizabeth got her reputation because she was a healer, having knowledge of home made remedies, herbs and potions. It was a skill much in demand during the early years of settlement when a doctor was seldom nearby. However, the rumors, about Elizabeth from nearly two hundred years ago still surface now and again. In was in the summer of 1976 that a descendant of Reuben and Elizabeth, who was living in Ohio came back to Grainger county, looking for their grave site. Since Reuben and Elizabeth were not buried in a regular cemetery, he had asked the pastor of a local church to help him in locating their graves. The pastor had spoken with member of his congregation and discovered that several of them knew where they were buried and were willing to lead the visitor to the graves. So, on a nice Sunday afternoon after services at the church were completed, the visitor, the pastor and four members of the congregation set out to find the graves. After leaving the church they drove down a two lane blacktop road, turned off on an old dirt road, and followed it until they reached a point at the bottom of a mountain. After unloading and a few minutes of discussion on the precise location of the graves, they began the ascent of the mountain. The climb was complicated by the fact that no real path existed and the visitor was elderly and leaned heavily on a cane. With a lot of assistance to the visitor the party arrived at the top of the mountain and declared that this was the final resting place of Reuben and Elizabeth Dalton. After resting and talking for a spell, the party was preparing to descend the mountain, when one of the ladies suggested that since they were there, perhaps they should gather around the graves, hold hands and say a prayer. They agreed that this was a good idea and the preacher began to lead the group in prayer. As soon as he started praying a woman's scream shattered the afternoon quiet. Those present later claimed that the scream appeared to come from the center of their circle and was so loud that they immediately covered their ears. It appeared that an instant decision was made by everyone that this was not the place they wanted to be. There was no amen said to end the prayer as a headlong race down the side of the mountain began. The visitor left his cane at the top of the mountain and although he did not request nor receive any assistance was the first to reach the road. The preacher finished a close second. Addendum: At the 2001 dedication ceremony, an attendee testified that his son, hidden among the trees, was the culprit. Elizabeth Shockley was the daughter of Richard Shockley and Elizabeth Adkinson. She was probably born in 1757 or later. It has been reported as late as 1768. There is evidence to support a birth date later than 1757. Elizabeth had her last child, Timothy, in 1810-1811. Assuming a birth year of 1757, she would have been 53 at the time of his birth. The only date we are sure of is that in 1810, she was over 45 years old. Enos Dalton, the first-born was born about 1772, according to census data, and other records. There is a span of 38 years between Enos and Timothy. If Elizabeth was also his mother she would have had to have been born 10 to 15 years earlier than 1768. This would have made her over 50 years old when Timothy was born. However, we also know that Reuben named all his children in his will and they included Enos and Timothy. In addition, Reuben remarked that Enos could continue possession of a certain piece of land known as Enos' field as long as his mother was alive and after that the land would be transferred to two of his brothers. Evidence also shows that Richard Shockley arrived in the Hillsville, Virginia area about 1773. His family, it is reported, did not join him there until 1775. Reuben Dalton arrived in the same area no earlier than 1780 and probably 1781 or 1782. He shows up on record in 1782. In order for a marriage between Reuben and Elizabeth prior to 1775, Richard Shockley and Reuben Dalton, would have had to have been together back in Pittsylvania County. I believe that Reuben and Elizabeth were married in Pittsylvania County about 1772. While I still have problems with Elizabeth's age, I believe she was the mother of all of Reuben's children. Elizabeth was still alive in 1823, but died prior to 1830. This could have been resolved if the 1820 census were available. The 1810 census for Reuben Dalton Sr was: 12101-11101. This indicates that living in his household were 1 male born between 1800-1810, 2 males born between 1794-1800, 1 male born between 1784-1794, 1 male over 45, who was probably Reuben Dalton Sr. The female included 1 female born between 1800-1810, 1 female born between 1794-1800, 1 female born between 1784-1794, and 1 female over 45 who was probably Elizabeth Shockley. Here are some Dalton queries from around the world and the sender could use your help in locating relatives. Some list emigrants to other countries for whom they have lost all contact. Please respond directly to the individual. Alan Dalton in New Zealand writes that his grandfather Michael Dalton (1858-1951) arrived in New Zealand in 1875 when he was 17 years of age. His great grandfather was also Michael Dalton, married Catherine Tobin and killed by a falling tree before his grandfather was born. His grandfather was baptised 28 Nov 1858 in St. Peter and Pauls Church, Clonmel, County Tipperary, Ireland. He lived in Glenaloughlin in the Nire valley. The Parish priest was W. J. Walsh who wrote to his grandmother in 1831. Michael and Catherine had five children: John emigrated to Australia, Pat, Cathleen and Mary to the USA, and Michael to New Zealand. Editor's note: The DGS located the last residence of Clement Dalton in Pawnee City, NE. Will any descendents of Clement please be in touch with Jon? Notes: The information is derived from parish registers in York, archival material in the City of York Archives and the 1841, 1851 and 1881 censuses for Yorkshire When reading the number of children, the reader should infer ‘at least’ as not all children have been traced. Continuation of ancestral chart from February 2005 issue of "Daltons in HIstory"
2-Thomas DALTON b. 1776, c. 7 Nov 1776, Christ Church, York. The following list of obituaries was extracted from the on-line web site of the New Orleans Public Library by DGS member, K. T. Mapstone. They were compiled by Colleen Fitzpatrick, a New Orleans researcher. Dates of the Dalton obituaries range from 1824 through the 1970's and cover a large period prior to the availability of the Social Security Death Index. The online index provides the name of the newspaper, date and page and for a modest fee will mail a copy.
? James T. Dalton, Chambers History, LA 1925, v. 3, p 86. 5 Aug 1950 (30), Dr. Richard A. Dalton, Jr., Item, Aug 6 1950. The New Orleans Public Library has a huge index of obituaries from all New Orleans newspapers from1840-1970. The DGS continues to update and add to the data for Ireland thanks to the efforts of Mike Dalton of Oregon. During the month of February 2005 Mike completed files for four more counties and they were added to the Dalton Data Bank They are: Counties, Sligo, Leitrim, Roscommon and Offaly. Click on Republic of Ireland. Counties Sligo and Leitrim. There were few Daltons in these two counties and the files are very small. Counties Offaly and Roscommon. Both counties are close to Westmeath Dalton and migration from their northern neighbor was heavy. Each file contains about 350 surnames.